If your business is planning on holding a conference or corporate meeting, or hosting a cocktail party, or social event, there’s a number of function venues to choose from all over Brisbane. Whether you require a bigger space for a large number of guests, or just a small, intimate venue, you’ll be able to find something to suit your needs. Here’s our pick of the top 6 corporate function venues in Queensland’s capital. The heritage listed Customs House building is among Brisbane’s premier function venues, located on the picturesque Brisbane River and available for hire Monday to Sunday. Customs House caters for a range of corporate events including conferences, working breakfasts, cocktail parties, launch events, team planning sessions and client meetings. The venue offers food and meal packages suitable for breakfast, lunch or dinner, or canapes for a stand up event, and you have the option to choose to dine in the restaurant on the Riverside Terrace, or within one of several private dining rooms. No matter the size of your guest list, you’ll be able to find a suitable room within Customs House – ranging from the Reid Room with a capacity of 10 people, to the long room that can hold up to 300 guests. This contemporary waterfront venue offers stunning views of the Brisbane River and is well-known for its unique cocktails and and relaxed atmosphere. WATT has a number of outdoor areas including terraces and balconies, perfect for summer corporate events, whether they’re small or large. The entire venue can hold up to 400 guests, otherwise there are a range of different sized flexible spaces; from The Playground, which holds a maximum of 40 people, to The Dining Room and Sun Room, which together can host 220 guests. Besides the incredible view, the venue is also close by to public transport and there are over 200 free car spaces at Brisbane Powerhouse. A list of menu and drinks packages for different types of functions can be found here. For an elegant corporate function look no further than Brisbane City Hall. 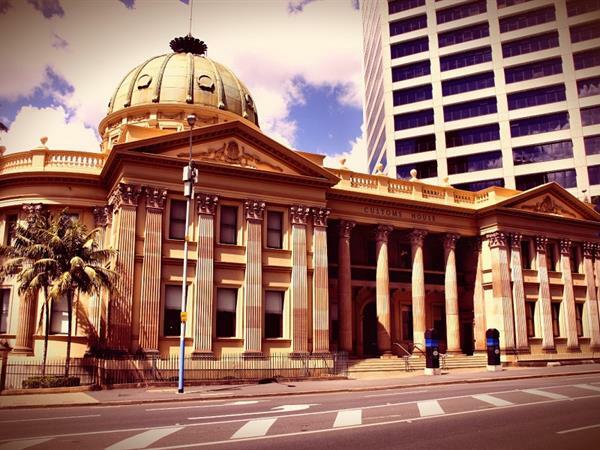 Following a 3 year $215 million restoration in 2013, it has become one Brisbane’s most iconic heritage listed venues. The sweeping marble staircases, mosaic floors and chandeliers are among just some of the features that make this venue truly spectacular. You can impress your guests in a number of different function rooms. The Main Auditorium – with a permanent stage and bathroom access – can fit up to 2,000 people and is perfect for large gala events and conferences. For smaller events, The Brisbane Room is suitable for sit down events of up to 180 people. Otherwise, if you’re looking to host a workshop or training session, The Kedron Room is your best choice. Just 2km out of the Brisbane CBD, the Victoria Function Venue gives you a choice between eight function rooms; from the Driving Lounge which has a capacity of 30 guests, to the entire venue capable of holding 1,000 people. Each room has panoramic views of the beautiful golf course and parking is free for all guests. Victoria Park Function Venue offers corporate packages for breakfast meetings, lunch or dinners, and cocktail parties. There is also a corporate golf package for a fun day out where your employees can try their hand at a round of golf. If you’re looking for a trendy young persons venue, Southbank Beer Garden is the only beach side beer garden in Brisbane. This venue makes the most of Brisbane’s warm climate, with the beautiful gardens situated by the water and beneath the afternoon sunshine. The function rooms cater for groups up to 300 people and offer an extensive menu including signature cocktails, shared plates and canapés. Southbank Beer Garden has hosted corporate networking events, cocktail parties, luncheons and after work drinks. Ideally located on the edge of South Bank parklands, Swiss-Belhotel Brisbane offers guests a sophisticated venue with 2 versatile meeting rooms that can hold up to 80 people combined. Featuring high quality facilities designed with business travellers in mind, Swiss-Belhotel Brisbane is the perfect venue for a medium sized conference in the heart of Brisbane. What’s more, with the Brisbane Convention & Exhibition Centre only a 10 minute walk away, Swiss-Belhotel offers the perfect accommodation base if you’re visiting Brisbane for a larger scale conference. Cliftons is located in the heart of Brisbane, close by to the Queen Street Mall. Booking an event through Cliftons means you have access to an on-site technical team, for assistance with video conferencing facilities and computers in the venue, as well as event coordinators and caterers. The technology and infrastructure available at this venue makes it perfect for corporate seminars, team training, conferences and meetings. There are 20 naturally lit rooms and resources for up to 120 people and Clifton's is easily accessible via public transport, with Central Station within walking distance. No matter the size or purpose of your corporate event, many function spaces across Brisbane offer flexible rooms that can be tailored to suit your needs. Whether you’re looking to host an elegant cocktail party overlooking views of the Brisbane River, a formal breakfast meeting, or a conference, you’ll be able to find the perfect package in one of these popular venues.